I originally wore this outfit on a lovely day recently with gorgeous Spring weather but didn't get chance to take any pictures. When I recreated the outfit for these photos, of course the weather was no where near as nice which resulted in some slightly more windswept photos than I'd hoped for. 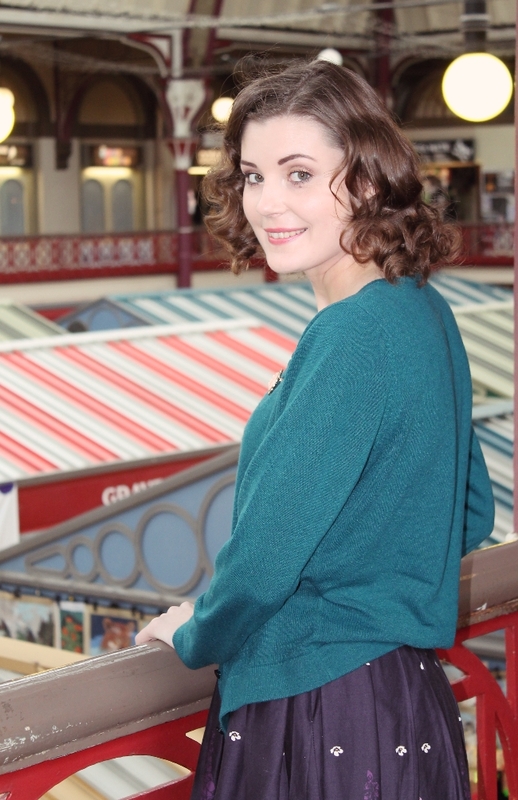 The photos were taken in the covered market which is a Victorian building. While it's not the most spectacular market in the world, I love to see the candy stripes of the shop awnings and the bright colours of the shops selling flowers, yarn, vegetables, confectionery and all manner of other things. 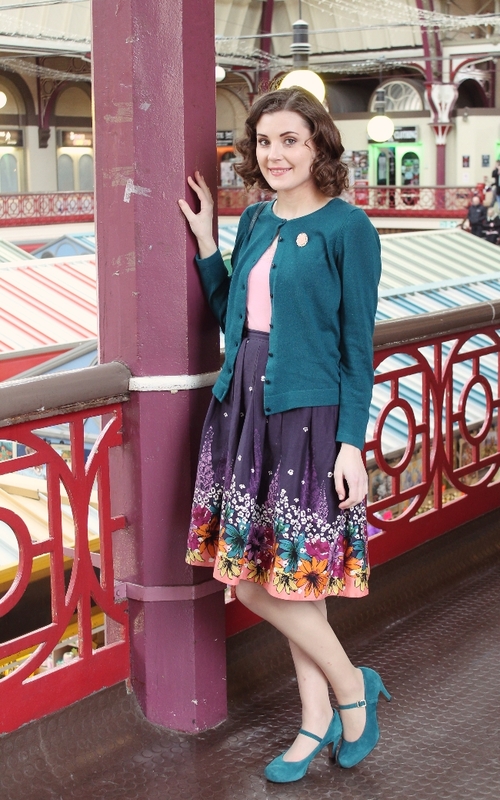 As for the outfit itself, I really love how it came together with the teal matched between my cardigan, skirt, shoes and bag (which you can just see the strap of on my shoulder in the first picture). I love how the pink and teal look together as well - it's a bit of an unexpected combination but one that seems to attract a lot of compliments when I wear it. I only wish I'd had a scarf in a coordinating colour to wind-proof my hair a bit better. It really needs cutting soon; it's getting really hard to manage. I fancy a change but I'm too lazy to have my hair coloured. I guess I'll see how I feel when I next go to the hairdresser! I love everything about this look, Helen! Fulls skirts are my favourite and the one you're wearing is stunning. I can't wait for outfits like this to be a norm - hurry up Spring! Quite right too - it can't be long now, I saw my first butterfly of the year today! Welcome! Hope you enjoy it. Wonderfully pretty outfit! 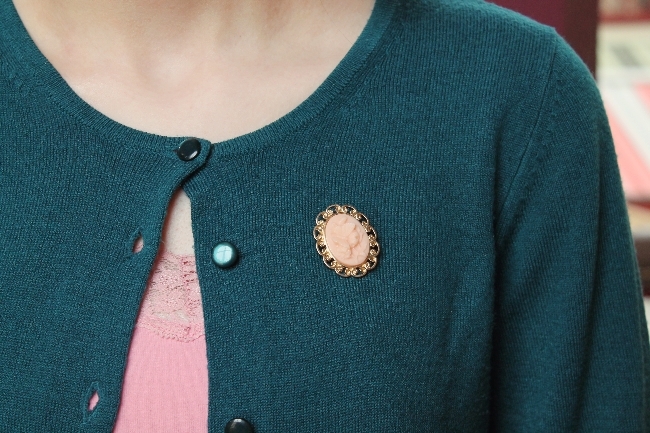 Teal + pink is always a winning combo in my books. They temper each other so splendidly and often telegraph a great 50s vibe, to boot, so that makes me love this duet all the more. 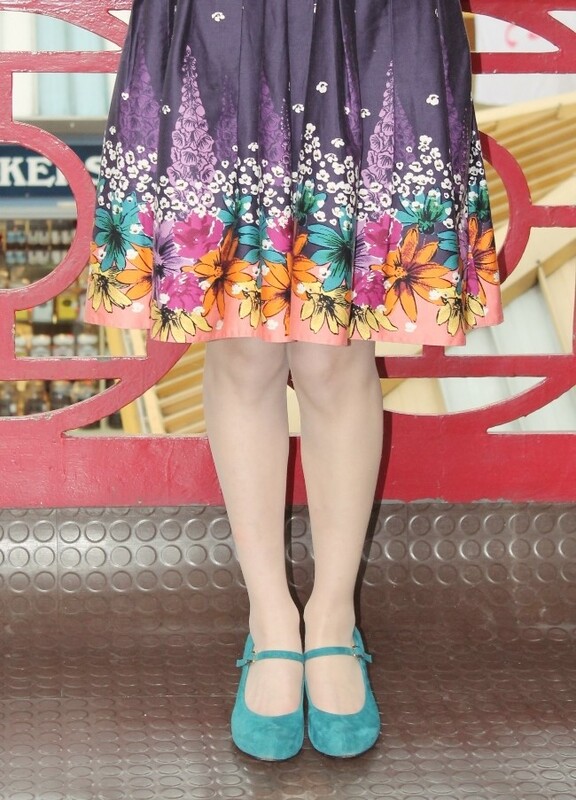 Perfectly Springy feeling outfit! Gives me some ideas.